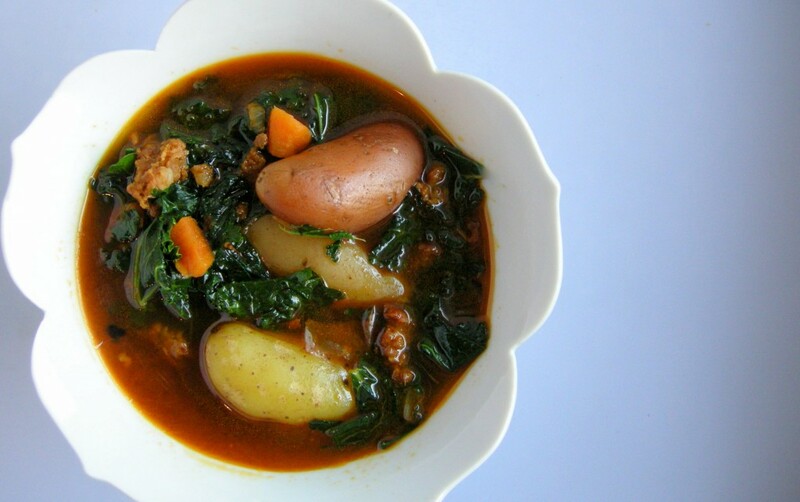 Caldo verde – a Portuguese soup classically featuring kale, potatoes and chorizo swimming in a nourishing, mineral-rich stock – is a remarkable dish. Richly flavored and deeply satisfying in a way only traditional peasant foods can manage, caldo verde is simple to prepare and a truly delightful addition to the supper table. Like all dishes – particularly soups and stews – that have found their way into the repertoire of much-loved family cooks, caldo verde is versatile: some versions include white beans, others omit carrots, some include linguiça sausage while others yet omit meat entirely. My version of caldo verde is generously seasoned, first by dried chili peppers and then by smoked Spanish paprika – a spice with a deep, beautiful smoky and spicy scent. The addition of these spices turns the broth a brilliant, dark red which contrasts dramatically with the deep green kale and the pale, creamy flesh of fingerling potatoes. Find the smallest fingerling potatoes you can for this dish. When prepared whole instead of chopped they add visual interest to the soup bowl making for a lovely, albeit rustic, presentation at the supper table. As with all dishes, it is essential that you choose the very best ingredients available to you when preparing caldo verde at home. Nourish yourself well by ensuring that you source your ingredients at their freshest, while supporting small farms that maintain sustainable and holistic methods in their approach to growing vegetables and raising livestock. By making this conscious choice you support your local economy and support your local agriculture, you ensure that the freshest foods reach your table and the fresher your foods are, the more nutrients they offer. Take care to use a good, homemade roast chicken stock or fresh chicken broth, which not only imparts a brilliantly rich flavor to the soup but is also dense in micronutrients, particularly trace minerals and other components such as glucosamine chondroitin1 – that hero of the supplement world which some experts believe may be useful in the treatment of arthritis2. Kale provides carotenoids, vitamin K1 and a good dose of the mineral manganese3. Richly spiced with chili peppers and smoked paprika, caldo verde is deeply flavored and brimming with nutrient-dense additions such as manganese-rich kale, potatoes and pasture-raised lard and chorizo. For both ease of preparation and for a lovely presentation, I recommend serving the potatoes whole. Set a kettle filled with clean water to boil, and boil potatoes until tender when pierced with the tines of a fork. Drain the potatoes and set them aside. In the same kettle in which you boiled the potatoes, heat bacon fat or pastured lard over a medium flame until melted. Add the chorizo to the pan and fry until thoroughly heated through and well-cooked. Add the chili peppers, shallots, garlic and carrots to the cooked chorizo and fry with the sausage until they become fragrant and tender. Pour two quarts homemade roast chicken stock into the kettle, and bring to a simmer. Stir as needed and allow the soup to cook for twenty to thirty minutes or so, add the cooked potatoes and continue to cook for another ten minutes. About five to ten minutes before you plan to serve the soup, turn off the heat and stir chopped kale, smoked paprika and unrefined sea salt into the soup. Cover with a tight-fitting lid and allow the caldo verde to rest for about five minutes or long enough to wilt the kale. Serve with a generous portion of unrefined extra virgin olive oil stirred into the soup at the last minute. This looks really good. I love chorizo. I will try this when the rainy season has arrived. My hubby loves chorizo. This soup looks great, he would love it. I adore soups like this – and I love that you keep the potatoes whole! Looks beautiful. Looks delicious! Wish I could have some right now! Lovely looking and I have made one similar with Italian sausage, kale and potatoes, really good! Bulk chorizo as in this recipe is actually Mexican in orgin. Spanish chorizo is usually cured, like a salami, and is made without cumin. Linguica is Portuguese and very garlicky and would be yummy in this recipe too. Alright, now I ‘m hungry! You’re *SO* right. There is nothing like an authentic Spanish chorizo or Portuguese linquica. I had some at my favorite restaurant and it was grilled and served with a frisee salad and poached egg. WOW! The garlic and paprika were amazing. Unfortunately, all I have access to is Mexican-style chorizo, but it’s not seasoned with cumin which I don’t think would go too well with the other flavors in the soup. I just use onion, garlic, extra virgin olive oil, chicken stock, potato, kale and sausage! And white beans, which I guess make it more like Caldo Gallego. Your version sounds lovely though! But I’d need to know what type of dried peppers…..the only ones I have are quite spicy, which seems like it might be too much with the chorizo! I was looking for a kale and potato soup, but something a little different than the traditional. This is perfect. Sounds rich and delicious. This soup is soooo good. We had it Saturday. It was cold, and damp out. The perfect weather for it. I found a mix of new potatoes for the soup. Yukon Gold, Red, and Purple. The smoked Paprika was hard to find but I am sure glad I found it. This is now added to our family favorites. My friend who was visiting liked it so much she took some home with her, and my nephew almost emptied the pot. Thank you for the recipe. I made your Kale Potato Chorizo soup this weekend. It was very delicious. Thanks for the recipe. what type of chili peppers are recommended? Hey Jenny, We met at the last Nourishing Traditions Conference and I love your blog and pictures…you are something! I made your “Caldo Verde” the other night and my husband and I adore it! And, being a chef, I rarely ever cook a recipe verbatim, but I looked at yours and thought, “there is no way I can improve upon this.” It’s divine and oh so satisfying. Thank you! I just made this soup recently, it was very rich and totally delicious. It is definitely one of my favorites now. The broth was beautiful and as satisfying with the goodies as without. Like Connie, above, I am glad I made the extra effort to find smoked paprika. Wow, was it worth it! Thank you so much for sharing your experiences and recipes here, it is most certainly appreciated! I made this for lunch today, with Trader Joe’s Chicken Andouille sausage……ABSOLUTELY EXCELLENT! A bit on the “hot” side, so I may cut back on the amount of chile pepper(s) in the future, but this is definitely a keeper! Great post. I kind of went my own way with the soup, experimenting with a more savory variety of sweet potato called Nancy Hall. I did, however, borrow the smoky paprika idea and it played off the slightly sweet of the potato and the spice of the sausage perfectly. If I go to using regular potatoes, I will keep them whole like you did–beautiful. Thanks! Deliciously nutritious! I’ll definately be creating this with love, for my little tribe this weekend. Thank you for sharing!! YES! I just made this for the family and it was delicious! We have Spanish Chorizo at our local Co-Op and I found a mixed bag of small purple, pink and yellow fingerlings; Beautiful presentation and amazingly sweet flavor. I could only find regular paprika but the sausage included some of the smoked variety so I would say I made the recipe as presented, which is a challenge for me 😉 Maybe a loaf of crusty sourdough bread next time? Amazing! This will be going on the weekly menu for frequent rotation. Thank you for sharing your gifts with the world Jenny, they are delicious!! I found this recipe years ago and have made it countless times. My only changes are instead of chorizo I use linguica, way more smoked paprika, and I serve it with lemon wedges. It’s a very good soup. But trust me on the lemon wedges.